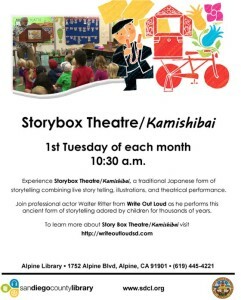 Kamishibai Storybox Theatre at the Alpine Library is held every 1st Tuesday of the month at 10:30am at the Alpine Library! Storybox Theatre / Kamishibai, a traditional Japanese form of storytelling combining live story telling, illustrations, and theatrical performance. Join professional actor Walter Ritter from “Write Out Loud” as he performs this ancient form of storytelling adored by children for thousands of years.